Today, Pentadimensional Games announced that its VR action game Megaton Rainfall will be available on Xbox One, Nintendo Switch, Oculus Rift, and Steam VR on September 5 for Xbox One and August 9 for the other platforms. Previously released on PlayStation 4 and PSVR, the game has sold nearly one hundred thousand units since its launch last year. In the game you play an indestructible superhero who tries to save the world from a global alien invasion. The problem is that you’re so powerful that you can destroy entire skyscrapers every time you miss your target. Another remarkable feature is the procedural destruction of the cities. In the game you can’t die in any way, but the city has a health bar, and if you let the aliens detroy too many buildings (or you miss your targets), you’ll leave a trail of collapsed buildings and it will be game over. 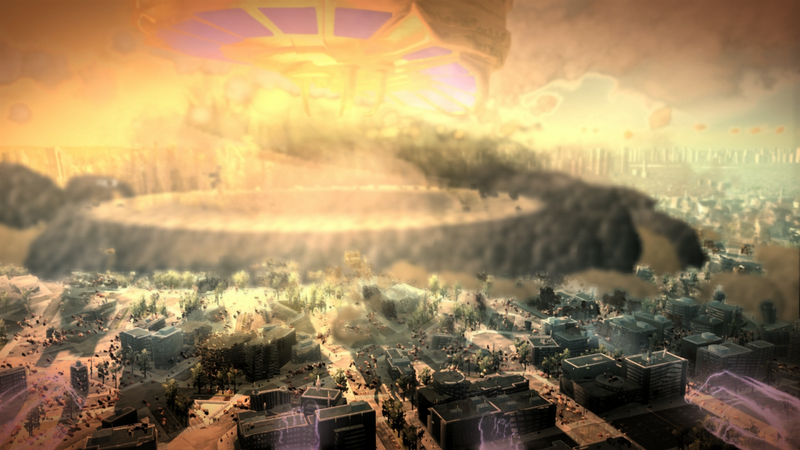 Megaton Rainfall has been around for 9 months, selling almost 100000 units (which is 5X our naively humble sales target), with its unique First Person Superhero Action and its outstanding soundtrack by the now BAFTA-winner David García. All the ports are powered by our proprietary engine and have been carefully implemented to get the most from each platform. Xbox One X users will get 4K support, the Switch will move the procedural destruction effects at 60 fps even in handheld mode, and the VR versions will get all-new gesture controls (flying and shooting energy blasts never felt so physical)… Including PlayStation Move (yes, we’ll also launch a patch in late August supporting it).